Generates radial colored aura lines following the gradient of the source clip. Raise the threshold parameter to produce glows in fewer areas. 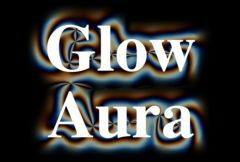 Adjust the Width, Frequency, Phase, and Twist parameters to make glows with different aura patterns. Source: The current track. The input clip that determines the glow locations and directions. Outer Brightness: Default: 1, Range: 0 or greater. Scales the brightness of the glows at further distances from the source. Glows will be generated from locations in the source clip that are brighter than this value. A value of 0.9 causes glows at only the brightest spots. A value of 0 causes glows on every non-black area. Scales the glow distance. This parameter can be adjusted using the Width Widget. Note that a zero glow width still enhances the bright areas; set the brightness parameter to zero if you want to pass the Source through unchanged. Frequency Green: Default: 1, Range: 0 or greater. Frequency Blue: Default: 1, Range: 0 or greater. Phase: Default: 0, Range: -5 to 5. Phase Red: Default: 0.2, Range: -5 to 5. Phase Green: Default: 0.1, Range: -5 to 5. Phase Blue: Default: 0, Range: -5 to 5. Twist: Default: 1, Range: any. Adjusts the spiral direction of the radial lines.